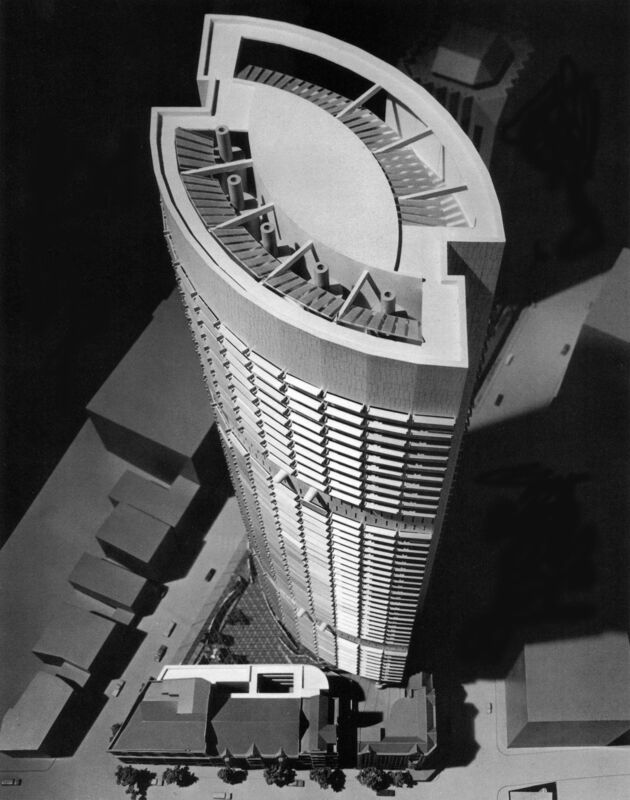 Architect Harry Seidler and artist Frank Stella collaborated on just one project - Grosvenor Place. 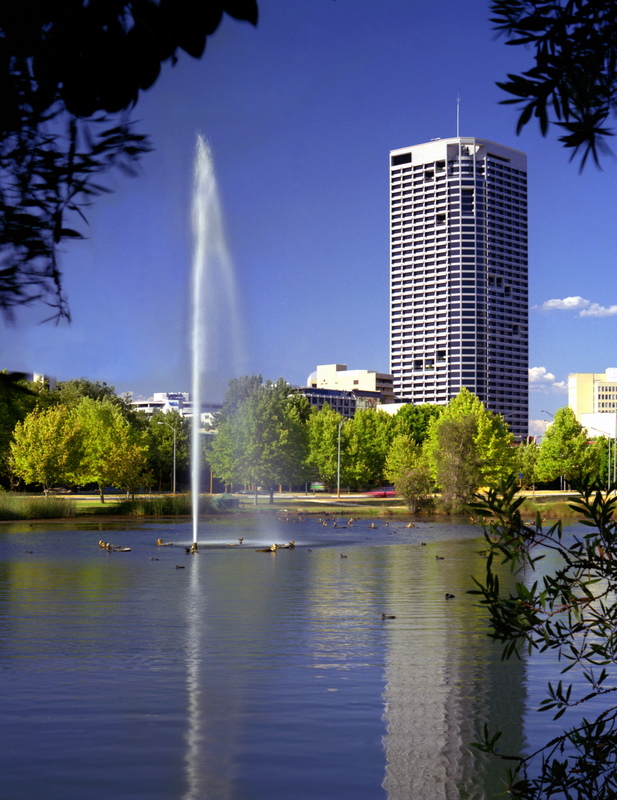 But the influence of Stella’s work is evident in the geometric plans of many towers and civic centres designed by Seidler. 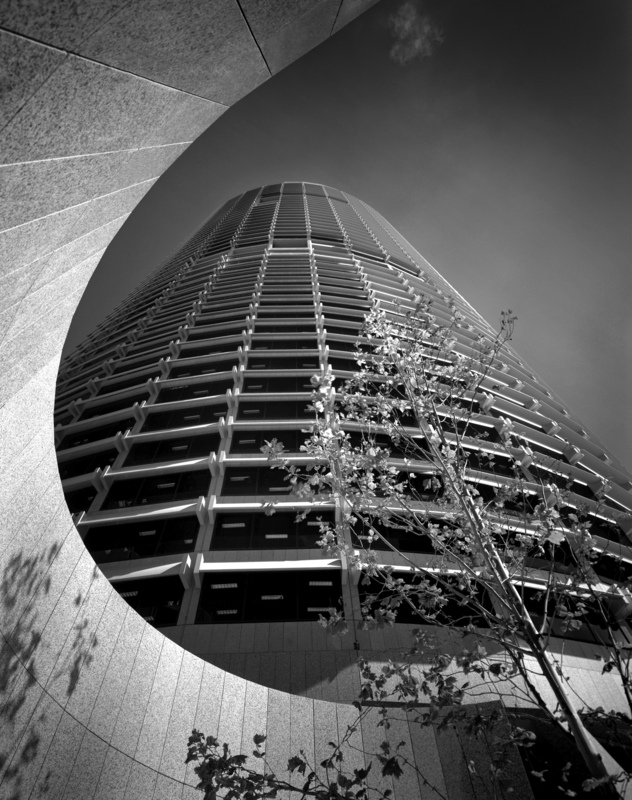 Some of the most fascinating and visually stimulating connections between architecture and art are found in the collaborations between Sydney-based modernist architect Harry Seidler AC (1923–2006) and American artists such as Norman Carlberg, Charles O Perry, Alexander Calder, and painter and sculptor Frank Stella. Three of Stella’s paintings in relief from the Cones and pillars series dramatically fill the lobby of Grosvenor Place with their dynamic and colourful presence. 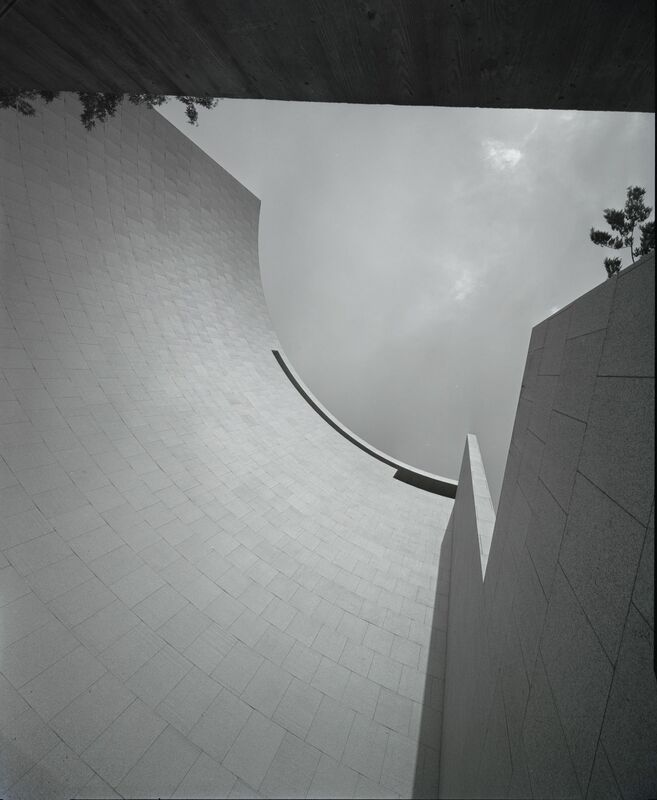 Many of Seidler’s projects demonstrate that he was consistently inspired by these American abstract expressionists and shared their infatuation with circular geometry. In his quest to enrich his work with fluid and plastic qualities, Seidler was particularly influenced by Stella’s Protractor series (1967–71). Comprising approximately 90 original paintings based on 27 diagrams, the series was inspired by and based on the shape of a protractor: a straight edge and a semicircle. Stella produced three variations for each of his Protractor diagrams, which he described as ‘interlaces, rainbows, and fans’. The artworks are stunningly theatrical and beautiful paintings-as-objects, pulsating with the pull–push effect of overlapping and interlacing bands of bright colours. If you compare Stella’s diagrams to many of Seidler’s subsequent architectural plans, you can readily see similarities in their geometric structures. This article was written by Vladimir Belogolovsky, who is the founder of the New York based Intercontinental Curatorial Project. He is the author of Harry Seidler: lifework (Rizzoli, 2014) and co-curator of the exhibition Harry Seidler: Painting Toward Architecture. I think these three works of Stella’s are utterly unfathomable. You don’t know where one element starts and the other goes. Stella is an amazing man because he is so completely of our time. He’s impatient, constantly changing, he moves from one thing to another, doing the utterly unpredictable. What fascinates me about his work is the implied visual impossibility of what he does. Twenty-one diagrams showing the geometric basis of Seidler’s tower plans. Harry Seidler & Associates, redrawn by Matteo Marzi, 2012. Courtesy Intercontinental Curatorial Project © Harry Seidler & Associates. The design of Stella’s Khurasan Gate is reflected in the plan of Seidler’s Australian Embassy, Abra is referenced in the main facade of the Monash City Council building (formerly Waverley Civic Centre), and Khurasan Gate (variation) can be identified in the plan of the unrealised Conzinc Riotinto development in Melbourne. Another painting, Flin flon III, based on one of the variations of Abra, contains patterns similar to those found in Seidler’s plans for Sydney’s Grosvenor Place and the unrealised Chevron Hotel and Offices in Melbourne. What is particularly intriguing about the geometric artworks in Stella’s Protractor series is that no matter how complex or flamboyant they might appear they rely on just one unit – the protractor, or semicircle. In the case of the Kufa Gate variations, the unit is reduced to a quadrant. Seidler adopted this geometry for his architectural plans, as it was inherently suitable for mass production: a circle is based on repetitive conditions as opposed to a rectangle or a square, which have special corner conditions. This was one of the ways the architect consistently pursued his mission – to achieve maximum effect with minimum effort. Waverley Civic Centre (now named Monash City Council), John Gollings, c1984. © Penelope Seidler. 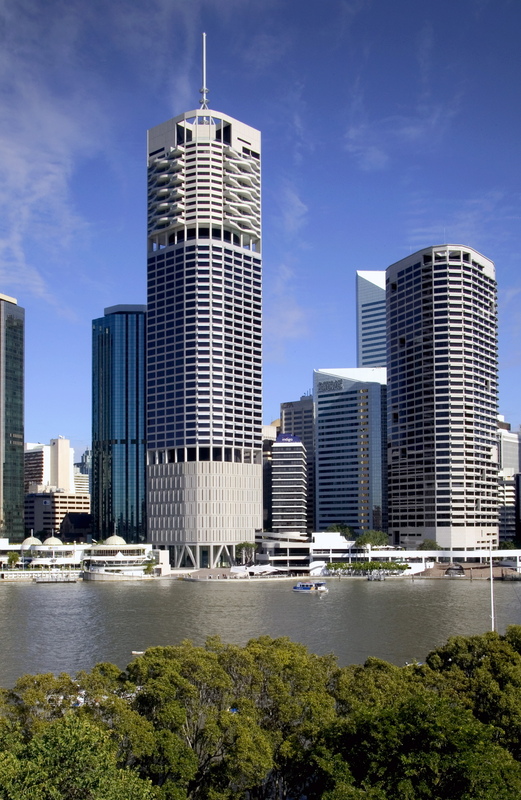 No matter how exuberant they appear, Seidler’s later towers – such as the QV1 Office Tower in Perth, and the Riverside Centre and the Riparian Plaza in Brisbane – are consistently and typically based on a repetition of one basic unit, the quadrant in concert with other curves and rectilinear geometry. Just as in Stella’s paintings, Seidler’s compositions are almost always resolved in plans that are then extruded vertically without further complications. It is the juxtaposition of curves in various horizontal planes that produces the spatial complexity required when these buildings are experienced in real life. Detail of Harry Seidler (right) and Frank Stella at Stella's studio in New York, December 1983. Courtesy and © Penelope Seidler. 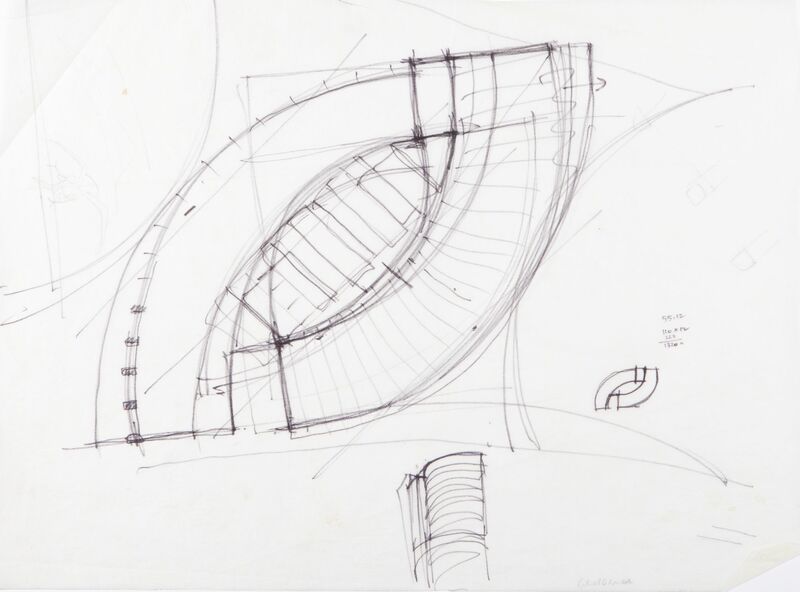 Sketch for Grosvenor Place, Harry Seidler, 1982, pen and ink on paper. Model of Grosvenor Place, Sydney, Max Dupain, May 1982. Max Dupain & Associates Archive: 12094-2. © Penelope Seidler. Grosvenor Place, Sydney, Eric Sierins, 1992. Max Dupain & Associates Archive: 14719-8. Courtesy Eric Sierins © Penelope Seidler. 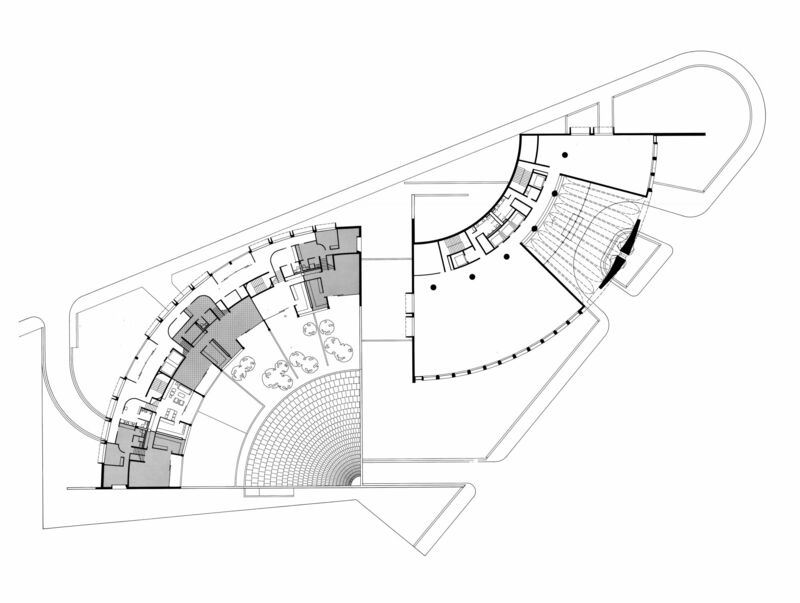 Australian Embassy ground-floor plan, Harry Seidler, c1972. Australian Embassy, Paris, Max Dupain, June 1978. Max Dupain & Associates Archive: 11612-23a, State Library of NSW © Penelope Seidler. Riparian Plaza, Brisbane, Eric Sierins, April 2006. Max Dupain & Associates Archive: 15175-1c. Courtesy and © Eric Sierins. QV1 building, Perth, Eric Sierins, January 1992. Max Dupain & Associates Archive 13862-18c. Courtesy Eric Sierins © Penelope Seidler.